Thick and Chewy Chocolate Chip Cookie - Let the Baking Begin! A good Chocolate Chip Cookie recipe is something that should be guarded just like a family heirloom. 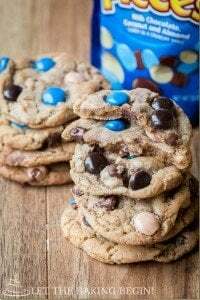 It was years and years before I found a recipe that has become our family’s absolute favorite, because it has all the qualities we like and want in a Chocolate Chip cookie. Thick, chewy, with the smell of browned butter, biting into a cookie is like reliving your best childhood memory. Add a cup of cold milk to it and you’ve got heaven. Right. There. Over the years I kept trying different recipes and while they were not bad, in fact even good, they were not “it”. Then, couple years ago while I was subscribed to America’s Test Kitchen magazine, I stumbled upon their Thick and Chewy Chocolate Chip cookie recipe. And let me tell you, it was an instant love! Ever since trying it for the first time, that is the only recipe I use. 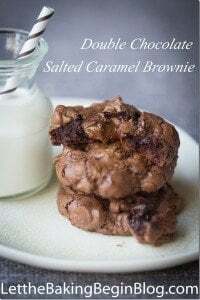 Whenever I make this recipe, I double or triple it and freeze the shaped balls of dough, so that anytime we want a treat we just pop a couple of cookies in the oven and 10 minutes later you’re ready to savor each bite of this sweet, sweet morsel. America’s Test Kitchen website has a whole article on why these are the best cookies and how they got to their perfect recipe, if you want to go ahead and check it out here, it’s pretty interesting actually. They even have a video with their recipe, so really, do check out that link! Every year for Valentine’s Day, my husband and I try to get out and get some time to ourselves. This year, we’re considering just taking the kids to a babysitter, and staying in to watch a movie and chew on some cookies, then washing them down with cold milk. I think we’re just tired. We need a break. Sigh… Is this what old feels like? 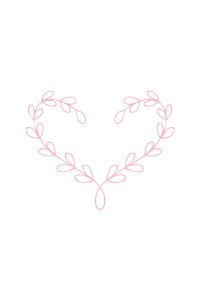 Are you doing anything fun this Valentine’s Day? Preheat oven to 375F degrees with the rack in the middle. Line 2 baking sheets with parchment paper. Combine the flour and the baking soda and whisk to combine, set aside. In a skillet melt and then brown for about 2-3 minutes 10 tablespoons of butter. You want a slight golden color, not dark amber color. The butter will start to smell like toffee. Transfer to a heatproof bowl and add the remaining 4 tablespoons of butter. Whisk until the butter is melted. Now add 1/2 cups granulated sugar, 3/4 cups packed dark brown sugar, 1 teaspoon of salt and vanilla extract and whisk until smooth, about 30 seconds. Let the mixture sit for 3 minutes, then whisk it again. Repeat 3 times (if you’re in a hurry, you can skip this step). Now add the egg and the egg yolk, one at a time, whisking or mixing after each addition until smooth batter forms. Now add the flour all at once and mix with a spatula or whisk with mixer just until combined. Then add chocolate chips and nuts (if using) and mix again. Using a 3 tablespoon cookie scoop, scoop up some dough and place 8 balls on a baking sheet, spacing them evenly between each other. Now bake the cookies for about 10-14 minutes. You want the cookies to be golden brown with the edges set, but the middle still soft and puffy. Each oven is different so you will have to figure out for yourself how many minutes exactly (between 10-14) is the perfect chewiness texture for you. I bake mine for 11 minutes. Transfer cookies to a wire rack to cool before serving. To freeze: If you plan to freeze the dough, just scoop the balls of dough onto a baking sheet and freeze. Then transfer to a ziplock bag and keep frozen for up to 2 months. To bake frozen cookies: put frozen cookies on a tray, about 8 per sheet (18×12) and bake for 12-15 minutes. 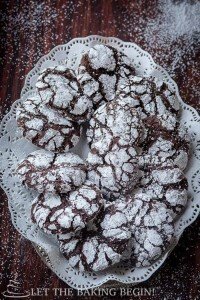 Chocolate Crinkle Cookies – Chocolate cookies that melt in your mouth with every bite! Plum Butter Cookies – Shortbread cookies with a plum butter and buttercream filling. 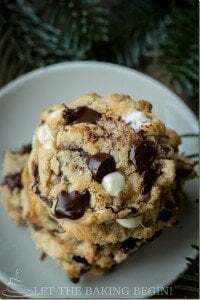 Best Almond Joy Cookies – Cookies with Almond Joy candy. This Thick Chewy Chocolate Chip Cookie with be your new favorite cookie recipe! A soft cookie with chocolate chips, the best homemade chocolate chip cookies. First, combine the flour and the baking soda and whisk to combine, set aside. In a skillet, melt and then brown for about 2-3 minutes 10 tablespoons of butter. You want a slight golden color, not dark amber color. The butter will start to smell like toffee. Transfer to a heatproof bowl and add the remaining 4 tablespoons of butter. Whisk until the butter is melted. Add 1/2 cups granulated sugar, 3/4 cups packed dark brown sugar, 1 teaspoon of salt and vanilla extract and whisk until smooth, about 30 seconds. Let the mixture sit for 3 minutes, then whisk it again. Repeat 3 times (if you're in a hurry, you can skip this step). Next add the egg and the egg yolk, one at a time, whisking or mixing after each addition until smooth batter forms. Bake the cookies for about 10-14 minutes. You want the cookies to be golden brown with the edges set, but the middle still soft and puffy. Each oven is different so you will have to figure out for yourself how many minutes exactly (between 10-14) is the perfect chewiness texture for you. I bake mine for 11 minutes. If you plan to freeze the dough, just scoop the balls of dough onto a baking sheet and freeze. Then transfer to a ziplock bag and keep frozen for up to 2 months. put frozen cookies on a tray, about 8 per sheet (18x12) and bake for 12-15 minutes. Best Almond Joy Cookies Ever! Do you know why these cookies flatten out in the oven and the dough looked to buttery? Is it because of the flour? What flour do you use? Thanks. I’ve not had this happen when I made them so I am not sure what could be causing this, but if I had to guess, I would think that something with the measurement of four is off. You could also try refrigerating or freezing the preshapes cookies before baking them, that usually helps with them retaining the shape better. But if you do this again, just make sure the flour measurements are what they’re supposed to be. I use Canadian flour, but this recipe is from the Cooks Illustrated and they use regular all-purpose flour. Thank you soooooo much!!! I had almost given up on making chocolate chip cookies, but when I saw this I decided to try once more and boy were they good!!! I made 2 batches and they disappeared fast! Thank you again!! Yay! So glad you found this recipe and loved it! The best chocolate chip cookies that I ever ate !!! Thanks for such a good recipe ! Wow! That’s great feedback! Thank you! I love how these cookies baked and the gooey consistency and I am curious if the salt amount of 1 tsp is correct. 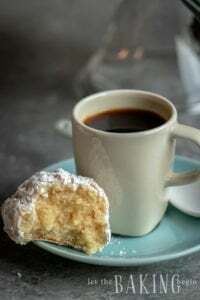 The dough tastes edible but pretty salty to me and maybe I am just ultra sensitive but I am curious if you can taste the salt in your dough and cookies when you eat them, and if that is what you are going for. Might be, just curious! Not going to stop me from eating all of them, let’s be honest! This is not the correct cookie recipe for their thick and chewy cookie. THis flattens out and is waaaaay to sugary. Chocolate Chip cookie is reminding me of my childhood. When I was a little girl I didn`t have so many choices and I had chocolate cookies only for X-mas. Now I`m happy I can make them for my children … even if they are taking everything for granted. These are THE BEST chocolate chip cookies I’ve made. I tripled the recipe today worried they won’t turn out cuz it was my first time making them but they turned out SO good!!! My children loved them too and said to always make them. I’m tossing all my other recipes for chocolate chip cookies and this one is now my family favorite! Thanks for the awesome recipes and God bless you and your family!!! We shall be on the road this weekend and I decided to make these for me and my son. Thank you so much ! Hope you enjoy them and thank you commenting! Thank you sooooo much for posting this recipe. My daughter made about 5 batches (for the trip) and as you can tell we loved how these cookies came out. What size of a scoop did you used? We used 2 tsp scoop and baked it for about 8 min. Size of the cookies were smaller and I think it was a great size since I have little kids. You’re welcome and thank you for posting your wonderful comment! Wow, 5 batches seems like a lot, but that depends on how long the trip is and how many people are traveling I guess, haha! For the recipe pictured I did use a 3 tablespoon scoop, but usually I use a scoop that is a little less than 2 tablespoons, I think it is 1 tablespoon and 2 tsp exactly. I agree that the smaller size is better for portion control, especially if you have kids. Nevertheless, it is much easier to overbake them when they’re smaller, so I guess you have to do what works for you. Thanks for sharing your feedback and hope you find more recipes that you will like!